Re-purposing is a general concept that is used in furniture design. Re-purposing antique furniture is something that is very popular right now in design because it also supports the Green movement. The process is much like redecorated a room, you keep the bones(architecture) of the room highlighted but change the interior around it. 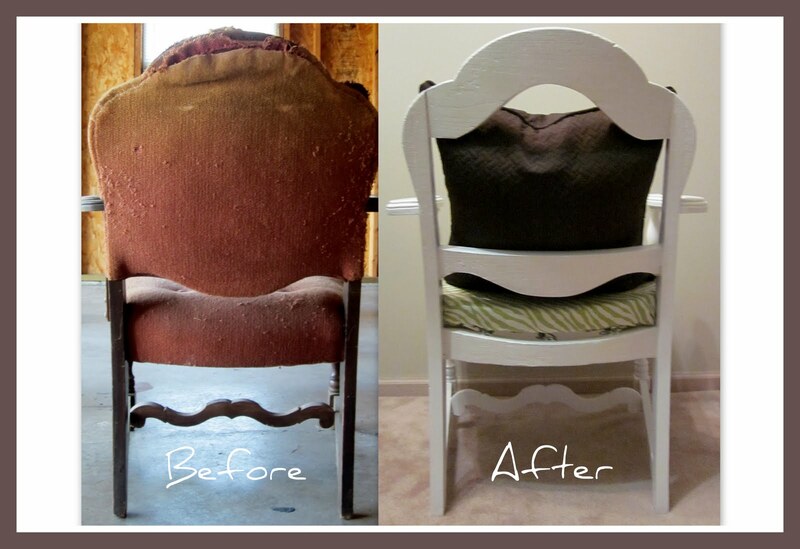 Re-purposing furniture is the same concept, you keep the bones of the furniture but give it a facelift. 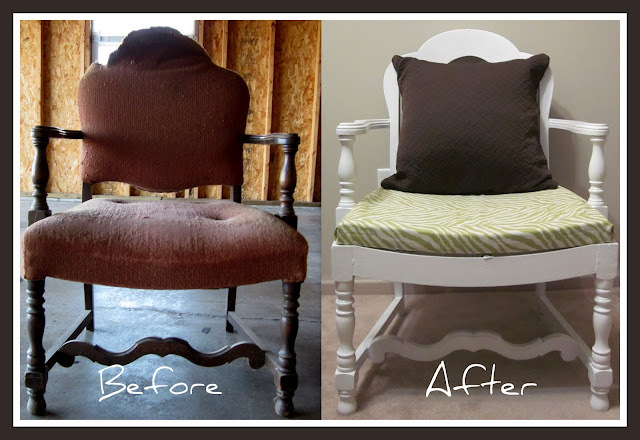 Re-purposing is a cheep way to create a one-of-a-kind piece of furniture that looks like you paid hundreds for it. 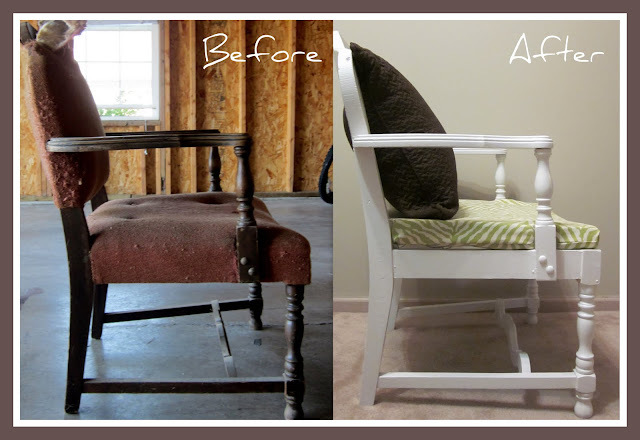 I have had my heart set for a long time on re-purposing an old armchair and making it into a vintage desk chair. This past week I got my opportunity. On the side of the road was an old dirty dirty armchair, with a $5 sticker. I knew I had to have it and loaded the chair and slipped my $5 into the mailbox. On the entire ride home I couldn't believe what I just found! As I researched the history of the chair, I didn't find much. I studied furniture in college but nothing about this chair stuck out except for the spring cushion with straw/hay stuffing (which made a massive mess). Spring cushions were popular in 1920's furniture design. Visually, one thing that sticks out that doesn't necessarily identify the style of the chair, is the stretcher at the bottom. The stretcher is what connects the front legs to the back and also runs across the middle making an "H" shape. As you see the middle stretcher is very detailed and makes the chair very distinctive. I also know that this chair was meant to be upholstered. When I striped the chair down the only wood that was detailed, treated, stained and lacquered was what is exposed now in the picture to the right. 1) I ripped off all the old and dirty upholstery. Inside the cushion was a mixture of cotton stuffing and straw/hay. I assume since the cushion had a spring base that the mixture of straw/hay and the thick cotton was important. Today upholstery is stapled in but this chair shows its date by the hundreds of nails that held the fabric in place. 2) I patiently, for hours, pulled out all the nails that were stuck in the wood. Around the nails were pieces of fabric that needed removed. From exposing that inside of the chair I could tell that the chair had been reupholstered at least once. Being reupholstered twice meant, twice as many holes! 3) I gave the chair a good washin'. It was clear that this chair hadn't been used in years and was sitting in a garage or a deep corner in the basement. I used wood soap to clean and scrub the chair. 4) I filled in all the holes with wood fill. This was important because I wasn't going to reupholster the chair but add a foam cushion. 5) After letting the wood fill sit over night, I sanded the entire chair. I had plans to paint the chair, so I had to make sure I sanded off any left over lacquer that once was on the chair. 6) After the chair was completely sanded, I dusted it. After sanding the chair it accumulated a lot of dust. It is important that there is no dust on the surface of the chair, so the paint stays clean and sticks. 7) I spray painted the spring cushion. Since I wasn't going to upholster it, I knew the spring cushion would show at the bottom of the chair. I spray painted the entire spring cushion white with a can that I had left over. 8) The next step should have been to prime the chair. I had half a quart of semi-gloss white paint. I knew that I had enough to do several coats, so primer wasn't that big of deal. I painted the chair completely white. After several coats it looked shinny and fabulous. 9) I put a shellac finish on the chair. I had a leftover can of shellac from a former wood project. I had just enough shellac to cover the entire chair. This finished and sealed the paint. This will protect the chair and give it a finished look. 10) I created a cushion template. Using a piece of poster board, I sat it on top of the spring cushion and traced the seat of the chair. After tracing the seat, I cut of the shape and had a template for my foam cushion. 11) I created the cushion. I bought a 24X24X2 inch piece of foam. I used the template, traced the shape on the foam and cut the foam to size. 12) I made a cover for the cushion. I bough a yard of heavy duty fabric. I do not sew but with ironing tape I created a pocket for the foam cushion to slide into. 13) I finally put the chair together! It turned out way better then I thought. I purchased the chair for $5, bought wood fill for $3, and the foam, ironing tape and fabric was $30. Everything else I had. This chair only cost me $38 to make! The chair is very sturdy, comfortable and sits great. That is so cool. Alex,I've always wanted to learn how to refurbish (no sure of spelling) furniture. So I'm glad that you explained how you did it.